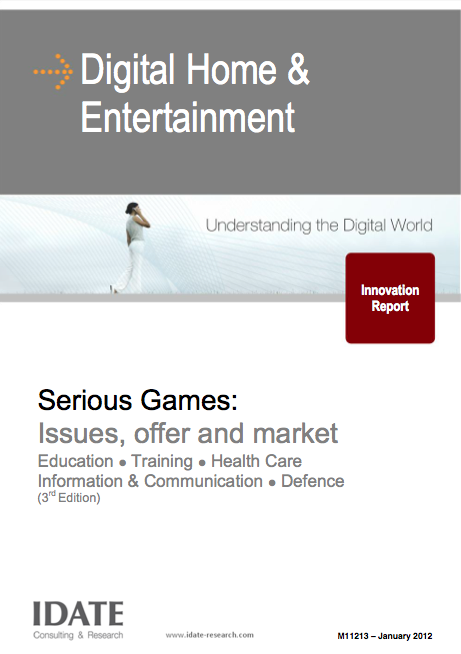 This study examines the various market segments of Serious Gaming based on detailed case studies and a systematic presentation of the corresponding technologies, practices and know-how, while emphasising on the key stages of the design, development and dissemination phases. It also provides technology and business prospects for each market segment. Serious Gaming (SG) is at the crossroads of several disciplines: e-learning, computing, engineering, virtual world design, communication and business expertise (health, energy, training, education, etc.). An "effective" serious game stems from the combination of skills from these various disciplines. While the success of a game is never guaranteed, even when all these core competences are represented in a given project, any failure is likely to be due to the absence of one of them. the introduction of high-end tools (when deemed necessary). Quality is also gaining ground, in particular through the growing awareness of SG developers of the need to add business skills (health, education, training, etc.) to their teams on top of pure video gaming expertise (game design, level design, animation, storytelling, etc.). Issues related to SG hosting platforms, distribution, marketing and operation are emerging, with the aim of structuring and streamlining, preferentially within a standardised framework, the downstream value chain. Akin to its predecessor, the video game industry, SG is a cross-platform industry. Currently predominantly deployed on PCs, it will naturally extend to connected TVs so as to reach out to less tech-savvy audiences, and embrace tablets, ideal complements to fixed platforms. It will leverage Internet access in order to integrate social and multiplayer features into the gameplay, but also to enable publishers to better understand how their games are being used, configure them remotely and monitor their success in real time. Between 2009 and 2010, the number of published titles has dropped by 33%. Whereas the demand may have been overestimated during the activity’s take-off phase, this trend is largely due the fact that publishers have started focusing on the quality of their production rather than on the sheer number of new releases. Although, in absolute terms, all SG areas are affected by this decline, in relative terms the fields of health and professional training have strengthened their representation. This phenomenon can be explained by the adequacy of business models with the services provided by SGs, their robustness, the maturity of the offer and a clearer articulation of the public’s needs and expectations. New business models continue nonetheless to be carved out and tested.